Using an account from the configured default realm worked — which makes plenty of sense as this is the provider UCS uses for authentication by default. However, I wanted to be able to specify the authentication realm in my scripts and override the default if necessary. I had an idea on how to attempt this configuration while looking at the remotely authenticated user section. You’ll notice in the screenshot below that I have a remotely connected LDAP user with a prefix of ucs-ldap22\ (its at the bottom of the image). Yes, that’s right. 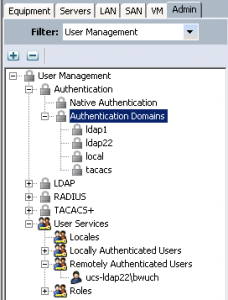 UCS hyphen NameOfAuthenticationDomain backslash UserName. I created an authentication domain named local, which maps to the local authentication provider, and then attempted to Connect-UCS specifying the username in the format ucs-local\myUserID — SUCCESS! Just thought I’d share this information in case anyone else has a similar need. Excellent, this helps me out quite a bit. Thanks for sharing this! Thanks for this post, it was a life saver! We’ve setup our UCS domains for LDAP auth, but I was trying to use a local account for some scripted backups. Thank you !!! Saved my sanity! !